Considering the cloudy weather, I decided to explore the New territories on this day. We reached Tsuen Wan at around 10:30 AM via MTR. The train was rather empty on this side of the city. If you take the Exit E at MTR station, it will directly lead you to Sam Tung UK museum. 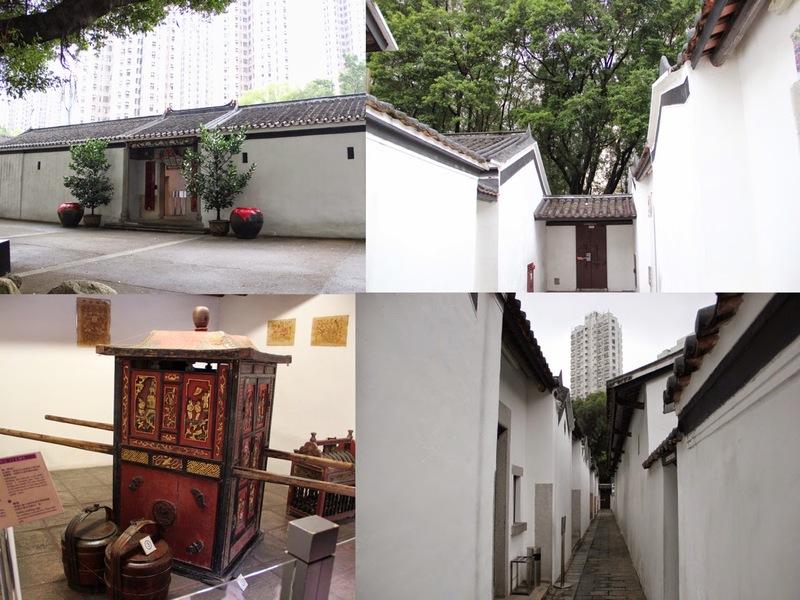 The museum is built in the form of a Hakka walled village and some interesting display of their life style and architecture. 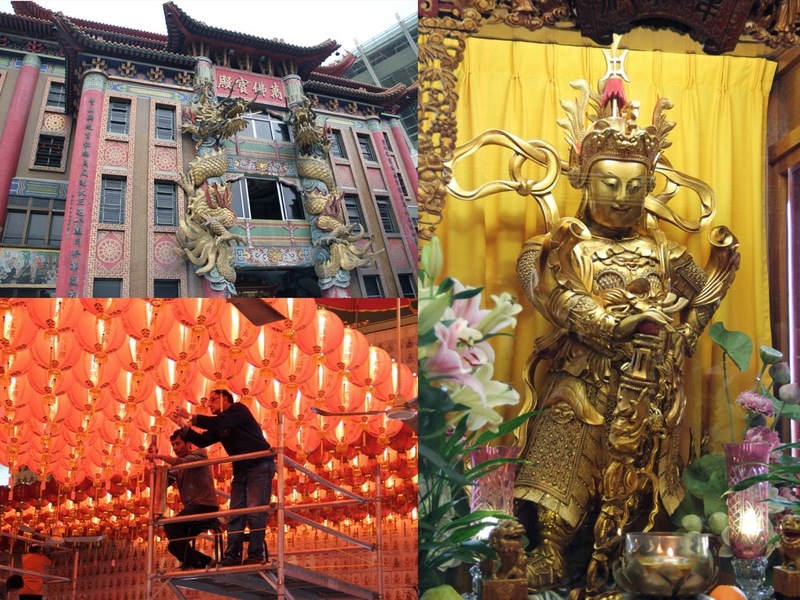 Our next destination in Tsuen Wan was the western monastery and Yuen Yuen university. To get here the lonely planet guide asked us to take a green minibus #81 from a Shiu Wo street. Without my cellphone, we struggled for almost close to an hour to find this street. Just before we were planning on giving up we saw a #81 minibus come from a small street. We followed the track to find the bus stop. The easiest route is take B1 exit at MTR and get down towards Cha Win road and then take a right at Shiu Wo st. The green bus will charge you HK$4 to the university. The bus will only stop at the first and the last stop so you can not board anywhere in between. The university has an interesting shrine. 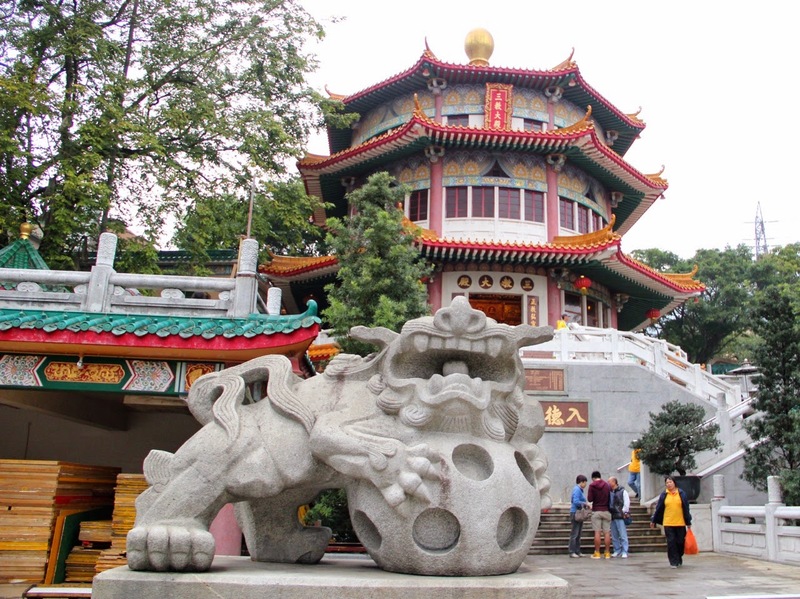 In the top floor of the shrine are the idols of Buddha and two other Taoist Gods. But what may interest you more is the floor below. There are idols of 60 reincarnations of a taoist saints, at representing a set of years. People offer incense sticks to the saint referring to their year of birth and that of the current year. There were lot of devotees praying here. A beautiful Western monastery stands a few meters downhill. 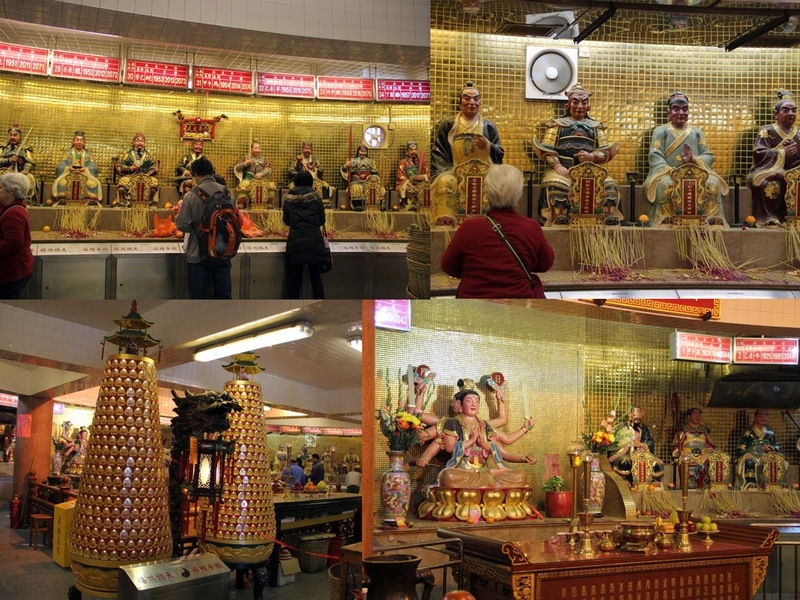 It appears to be recently renovated and devotees are still gathering donations for its renovation. There are again some impressive Buddha idols inside the main shrine. We then returned back to Tsuen Wan in another Route #81 green minibus. Skipping the Chuk lam sim monastery, we decided to head directly to Tuen Mun. To reach Chuk Lam Sim monastery you have to take route # 85 from he same bus stop where you board route #81. To Tuen mun we had to head back to the bus station in Tsuen Wan and take a bus #60M. 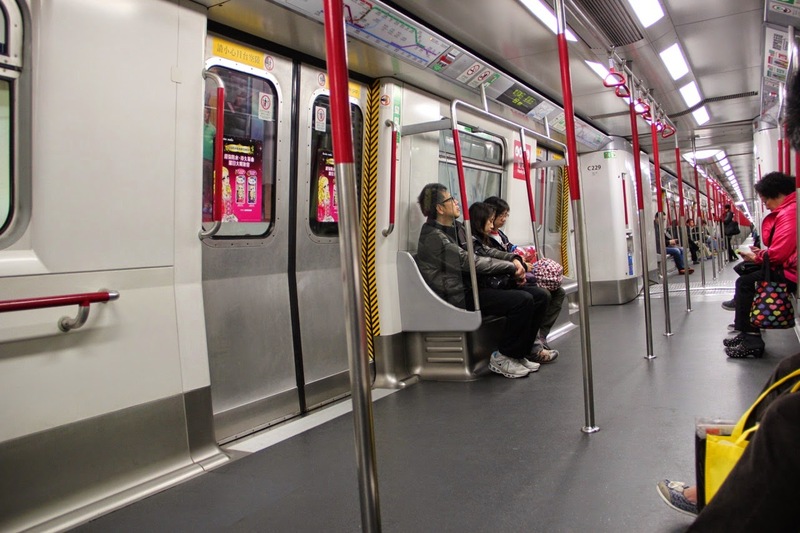 You could also ride the MTR. But the bus ride is more fun always as you can enjoy the views. 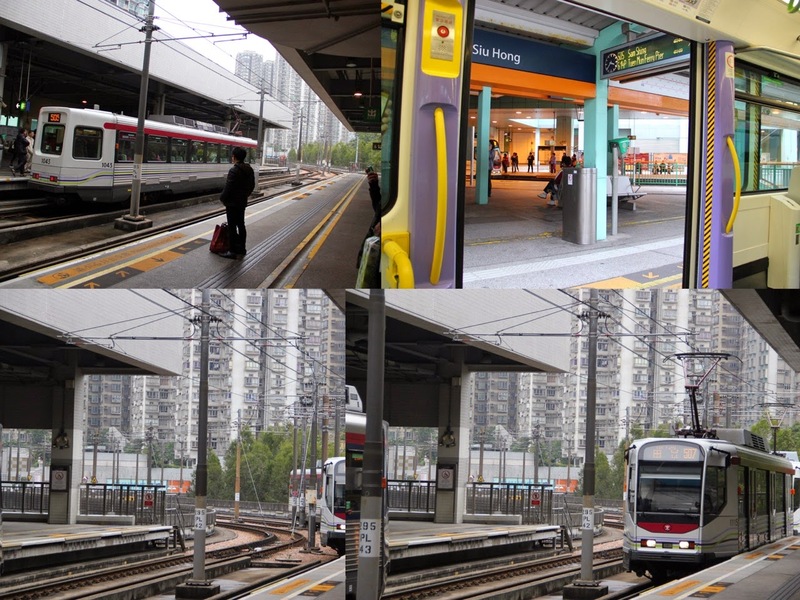 In this part of the new Territories you bid farewell to MTR and start using light rails. They are well connected and are really cool. The light rail stations are just open platforms with readers for you to swipe your octopus card. Well, you could easily cheat without swiping and there is no way anybody would no. However, we saw no one do that. Everyone swiped their card religiously when they entered and exited the station. I am truly impressed by their honesty. I wondered if this would ever work in my country. I knew the answer. We took the rail 751 to Lam Tei station and crossed the road to reach the Miu Fat Monastery. Beautifully built complex has some impressive Buddha idols. Devotees were busy preparing the interiors for some ceremony. Just next to the monastery is a new tower that resembles a lotus. 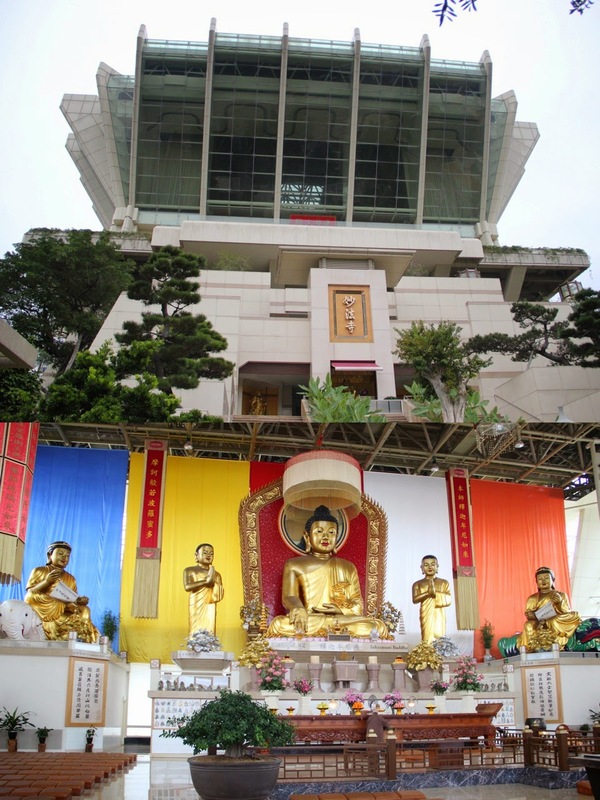 Again huge Buddha idols reside int he top most floor of this structure. A view of the the city from the top is beautiful. Again skipping the Chung Chung Temple (Rail route 505), we took a 614 light rail to Ping Shan. 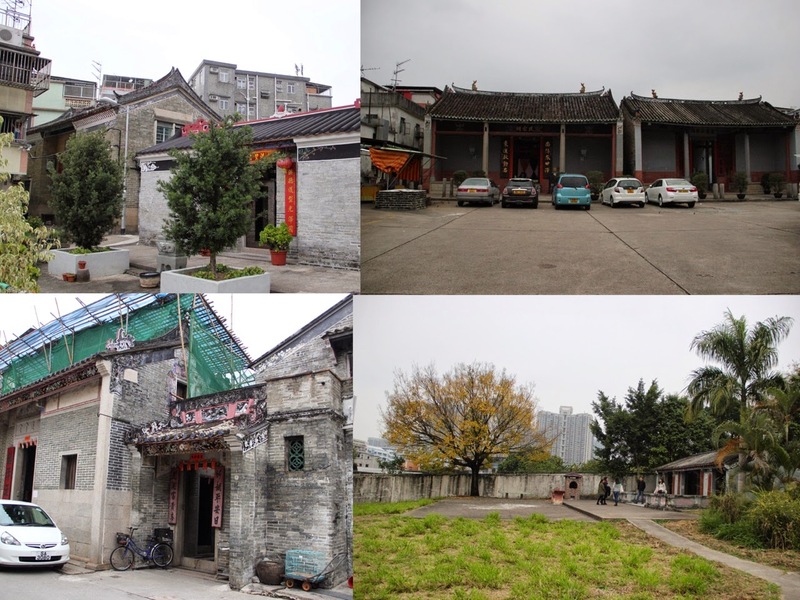 Ping shan is known for its heritage trail that takes you on a 1km walk around the ancient walled city. There remains some signs of the same that are being protected by the government. As soon as you get off at the station pink signboards will guide you to the location. You have to first walk up to the Ping Shan Tang Gallery uphill. Here, at the visitor centre you can take a map for the heritage walk. 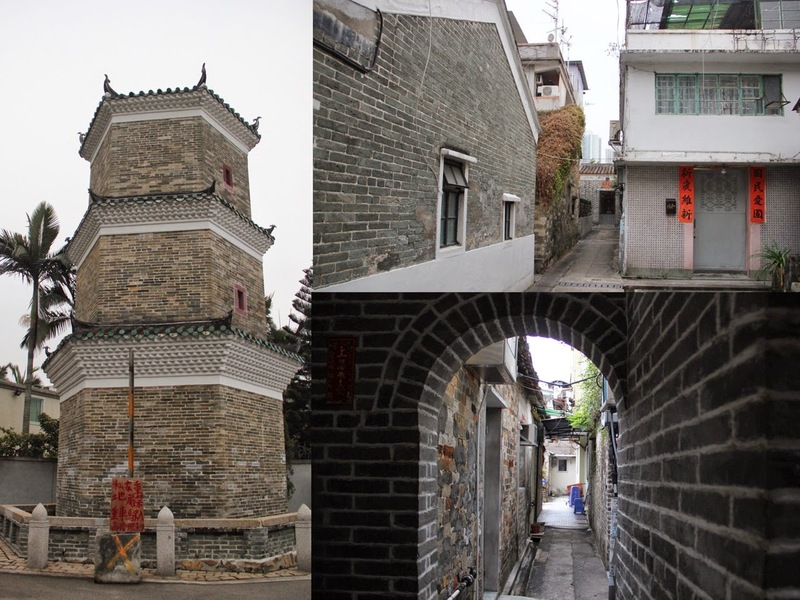 The trial will take you through 3 old but lively villages and several remaining structures built by the Tang clan. 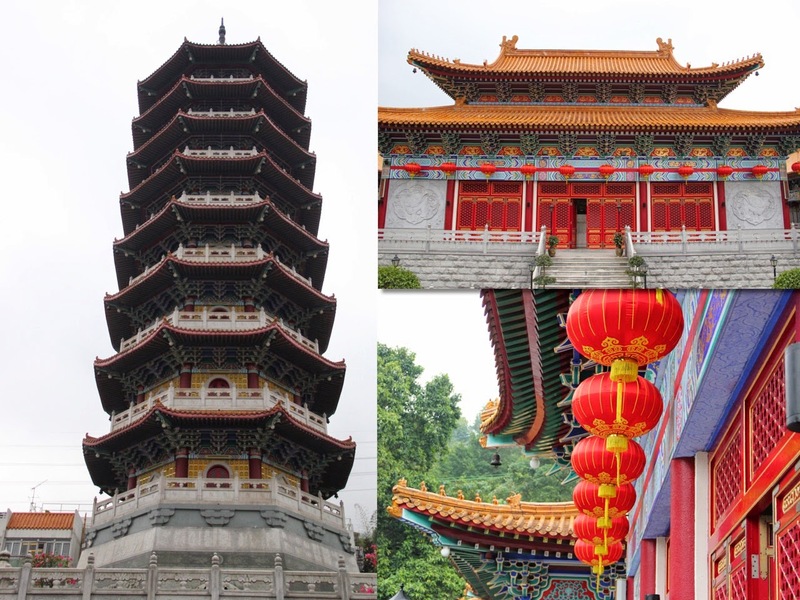 The route will take you to Hung Shing Temple, Ching Shu Hin Chamber and Kun Ting Stuyhall, Tang Ancestral Hall, an ancient well, a pagoda and some remains of a walled city. It is impossible not to imagine how a city might have flourished here several years ago. From Ping Shan we returned back to hostel as most of the other places close by 5PM. So it is always advisable to start early. We tried to locate an indian grocery store near Sham Shui Po but had no success in spite of some indians/Pakistani restaurant owners tried to direct us. We had dinner at Kashmir curry restaurant. Its a small place on Chung wan road and not that good. 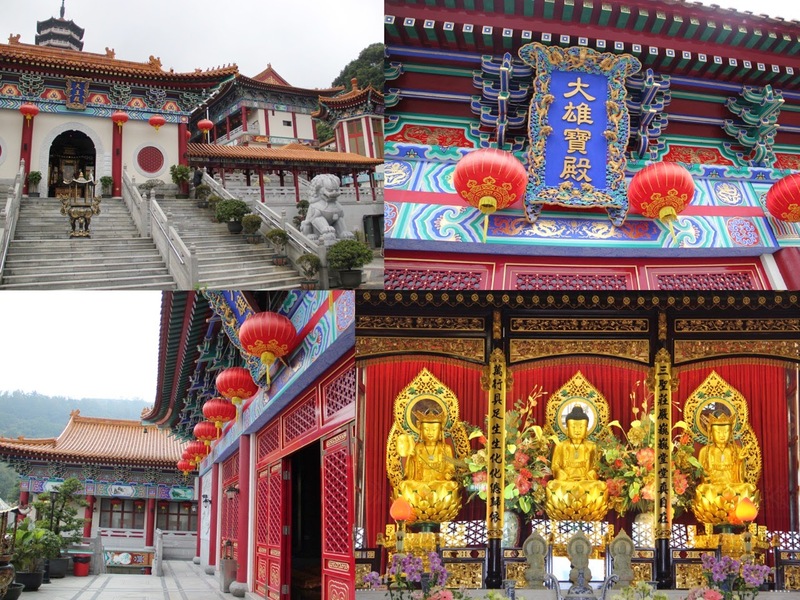 Some of the other places in the New territories that we could not go to but is worth a visit - Mai Po marshes and Hong Kong Wetland park in Yuen Long, Tai Po market and 10,000 Buddhas monastery at Sha tin.